Specific to Las Vegas, the biggest challenge I foresee is keeping Nevada’s business taxation policies how they are, and avoiding the destructive policies of California, which seem to be creeping their way into our state. 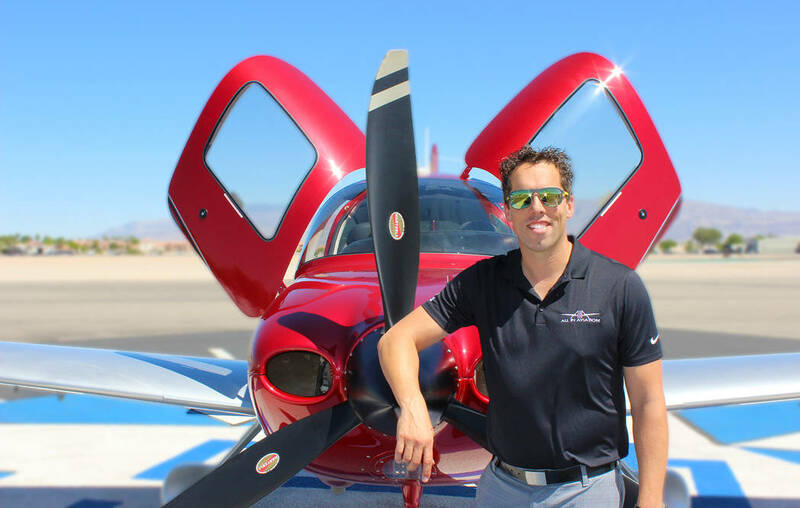 A: Most of my reading is aviation trade publications and forums, such as Aviation International News and the Cirrus Owners & Pilots Association (COPA) Forum, which help me stay up to date on everything in my particular industry. There are so many aspects of aviation, and our customers expect us to be in the know on industry news and general aviation developments. When I’m not immersing myself in aviation, I really love reading Dave Ramsey’s published works on personal and business finance. Every other year I try to attend his EntreLeadership Summit, and I look forward to doing so this year. A: That depends if it’s lunch or dinner. Call me an aviation junky, but for lunch I really love The Landings inside the Henderson Executive Airport terminal. I just love the views of airplanes taking off and touching down, the Las Vegas Strip in the background, the atmosphere of fellow aviators and business professionals mixing, great food and customer service. It’s just a wonderful environment. A: Our go-to restaurant for dinner is Ventano Italian Grill. With a great view of the Las Vegas Valley, excellent food, a great wine selection and fair value. I have yet to have anyone say it wasn’t one of their favorite Italian restaurants. A: With all the travel required for work, the easiest exercise is to lace up a pair of athletic shoes and go for a run.It allows me to really get to know the area I’m visiting. When a free morning or afternoon becomes available, there is nothing like hitting the golf course with friends or clients. And, now with the Vegas Golden Knights in town, I find myself watching hockey more than playing a sport myself. A: Socializing with friends on the weekend is definitely what I look forward to, and if there is a way to incorporate flying somewhere, it’s even better. The freedom of taking an airplane on a double date to a unique, difficult-to-get-to location is something we love sharing with our friends. Places like Sedona, Death Valley, Big Bear and Palm Springs are all within an hour’s flight, and make for a memorable time together. The lifestyle of a pilot — being able to go anywhere at any time — is something I’m very blessed to be able to enjoy for work and for recreation. A: In my industry, the biggest challenge is the current pilot shortage, and it seems to only be getting worse. While not exclusive to Las Vegas, there aren’t enough new pilots coming into the ranks to replace those who are retiring. Specific to Las Vegas, the biggest challenge I foresee is keeping Nevada’s business taxation policies how they are, and avoiding the destructive policies of California, which seem to be creeping their way into our state.